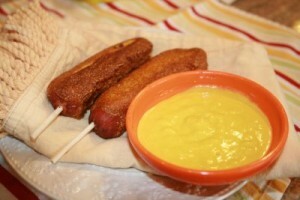 Corn Dogs recipe by Marium at DesiRecipes.com. In a large mixing bowl, combine egg, corn muffin mix, milk and 1 seasoning packet. In a separate shallow dish, mix second seasoning packet and flour. Insert wooden skewers half way into hot dogs. Heat oil to 360 degrees F in a deepfryer. Dredge each beef frank in flour seasoning mix, dust off excess then dip into cornmeal batter. Fry 2 to 3 corn dogs at a time for about 3 minutes or until golden brown. Drain on paper towels. Serve warm.